The Red Mountain Hounds hunt a pack of Penn-Marydel Foxhounds. The Penn-Marydel (PMD) hound is a variety of American Foxhound that was developed in Pennsylvania and the Eastern Shore of Maryland/Delaware, hence the name. Although only formally recognized by the MFHA as a separate breed in 2008, PMD’s were developed in the early 1900s. The breed is well known for having a strong nose and loud, deep voice that carries over terrain - which is well suited for our wooded hunt country. The goal of our breeding program is to produce a pack of hounds that run uniformly, give great tongue (known as cry), show stamina, a keen sense of smell (nose), and obey the Huntsman’s commands (biddable)…all traits that are common in a good PMD hound. Located in Rougemont, North Carolina, the Red Mountain Hounds kennels boast 25 couple of Penn-Marydel foxhounds. Long before hunt season even begins, the huntsman starts working the hounds. Hound exercise is the first step. Not only is it for the physical health of the hounds, but it also teaches young hounds to work as a team. Late summer and early fall young hounds are introduced to the pack. To aide in their education, their collars are linked or coupled with an older and experienced hound. Hence, foxhounds are usually counted by the number of "couples"; i.e. 12 couple equals 24 hounds. They not only learn how to hunt, but more importantly how to hunt as a pack. The whippers-in and volunteers from the hunt help the huntsman to train and exercise the hounds. 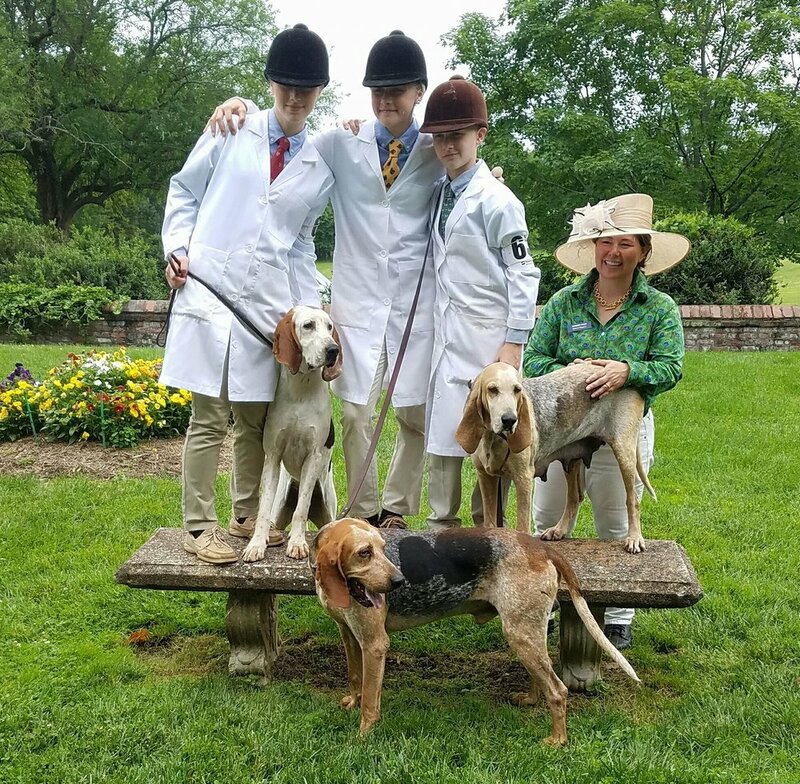 In addition to hunting, throughout the year the hounds also participate in performance trials, where they are judged on their hunting abilities, and in MFHA-sanctioned hound shows, where they are judged on their conformation and adherence to the breed standards.